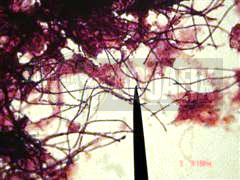 Microthrix parvicella is a Gram positive, Neisser negative filament that often appears as long, thin strands in tangles, reminiscent of spaghetti, with no branching or visible cell septa (1). When incorporated within the floc structure, it may stain Gram variable (1). This organism has no sulfur granules, no attached growth or sheath present (1) and is able to take up and store long-chain fatty acids under anaerobic conditions until levels of nitrate and oxygen are suitable for growth (2). In the early stages, Microthrix parvicella may go unnoticed since it generally forms shorter filaments (<150 um) with clear spaces inside the filaments and a variable Gram stain reaction (it does not yet cause foam in this stage) (3). Microthrix parvicella has been shown to have a relatively hydrophobic cell surface (2), which also makes the cells water resistance and enables them to float when aerated (1). In most cases, the long filaments protrude from smaller flocs and interact to form inter-floc bridges, which prevents compacting and settling to generate a net like structure within the sludge. 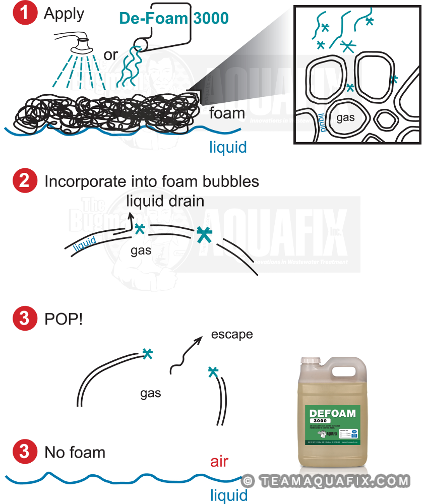 This traps gasses and other hydrophobic particles in the foam (6). As M. parvicella competes better at low F:M than floc-forming bacteria, reducing detention time in the aeration basin may be beneficial (1, 5). This is further backed by experimentation, which showed that M. parvicella content was determined to be highly dependent on the SRT with eventual elimination from the system at an SRT of lower than 5.7 days, which may also suppress growth of Type 0041 and Type 0675 (3). However, reduction of the detention time may not be possible, as it could result in incomplete nitrification, which may promote growth (3, 4, 6). Although not recommended, some chemical measures that have been shown to be effective against Microthrix parvicella, include: dosing with polyaluminum chloride (PAC) (5) or other aluminum salts at 3.5 g Al/ Kg MLSS per day (this may reduce floc size) (4), or extensive chlorination or RAS chlorination (1). The use of PAC is supposed to help in flocculating and settling the filaments but it has been found only slightly effective. Flocculating and precipitating the filaments is a good idea but it does not address the cause of the problem like Foam Buster does. 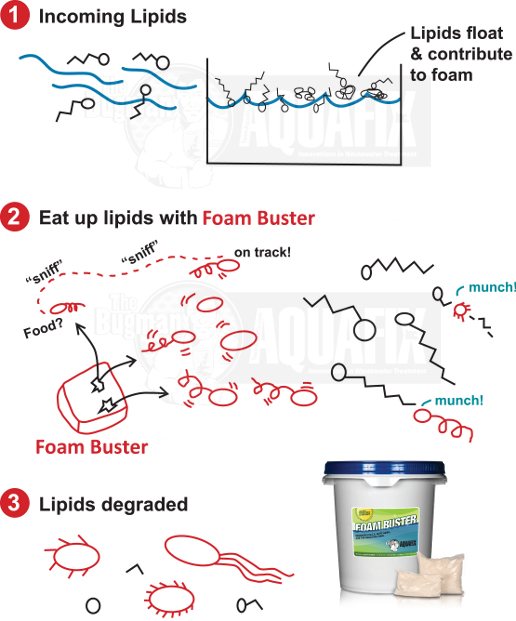 Aquafix biological alternatives to treating Microthrix parvicella include a two-step treatment where first DeFoam 3000 is applied to collapse the foam structure resulting in the return of the organism and lipid substrates to the mixed liquor where the fatty acid substrates can then be digested by the addition of a bacterial biostimulant product Foam Buster. An additional measure, is to add Qwik-Zyme L to the problem basin to catalyze and degrade the lipid substrates to be digested faster. 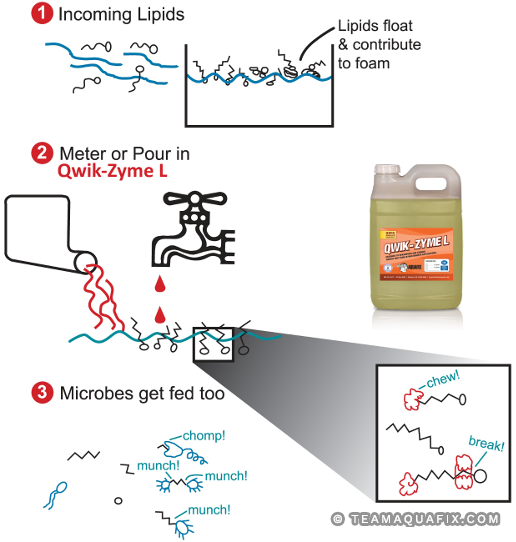 Qwik-Zyme L: Catalyze and break down surfactants and F.O.G. Low temperatures (5) with populations generally appearing around late autumn (4) and reaching their max at end of winter (4). High amounts of fats, oils and grease. Presence of long-chain fatty acids (5), in particular, high amounts of oleic acid or lower amounts with higher levels of volatile fatty acids or saturated fatty acids of medium length (eg. Caproic, caprylic, and lauric acids (6). Low dissolved oxygen levels contributing to incomplete nitrification also promote growth since ammonium sulfate is the main nitrogen source used (4, 6). High pH, more than 7.1 (6). It was found that M. parvicella does not use unesterified long-chain fatty acids as they may be difficult to access in water, nor does it use typical microbial substrates (used by most floc-forming bacteria) such as fructose, glucose, citric acid, succinic acid, or lactic acid (6). The activity of a surface-associated extracellular lipase was observed, indicating that M. parvicella is able to degrade lipids near the cell surface (2). 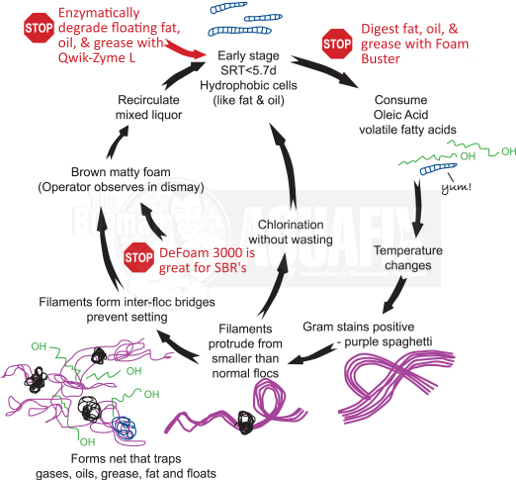 It is also know that this filamentous bacterium requires oleic acid and other long chain fatty acids for incorporation into cell membranes for growth unlike most floc-forming bacteria (2). The maintenance energy requirement (minimum energy input necessary for cellular biochemical processes) has been calculated and shows that M. Parvicella has a lower maintenance energy requirement than floc-forming bacteria (3) allowing it to survive under conditions where most floc-forming bacteria cannot such as with low F:M.
“Microthrix Parvicella.” asissludge.com. 2000. Activated sludge information systems. October 2009. Wanner, Jiri. Activated sludge bulking and foaming control, First edition. Boca Raton, FL: CRC Press LLC, 24, Nov. 1994.